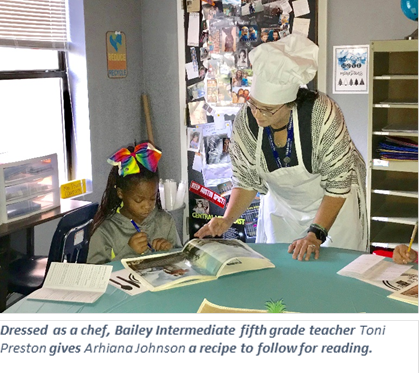 Bailey Intermediate fifth grade students arrived in their reading classes this week and discovered their rooms had been transformed into cafes. On a quest to awaken the inner reader in every student, the teachers offered a yummy way to expand the readers’ palates with a book tasting. The students were served various types of fiction to nibble on before deciding what they wanted to devour. The activity was one the teachers participated in, during staff development.